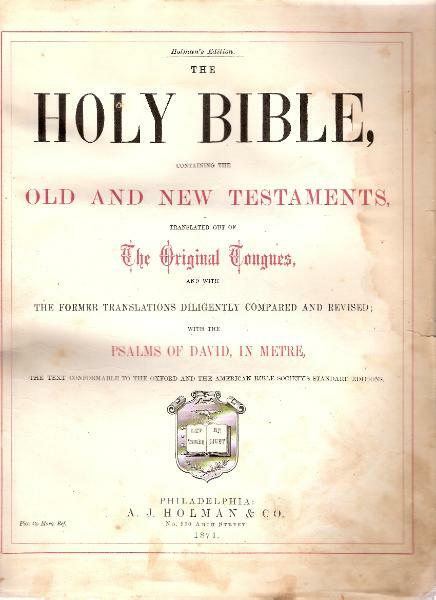 Holy Bible in English; A. J. Holman & Co., Philadelphia, 1874.
children and step-children from those marriages. 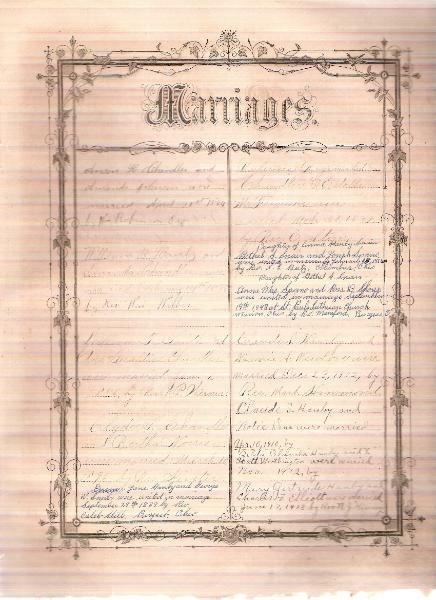 William T Smith and Edna Geraldine Chandler were married Jan. 9, 1896, by Rev. 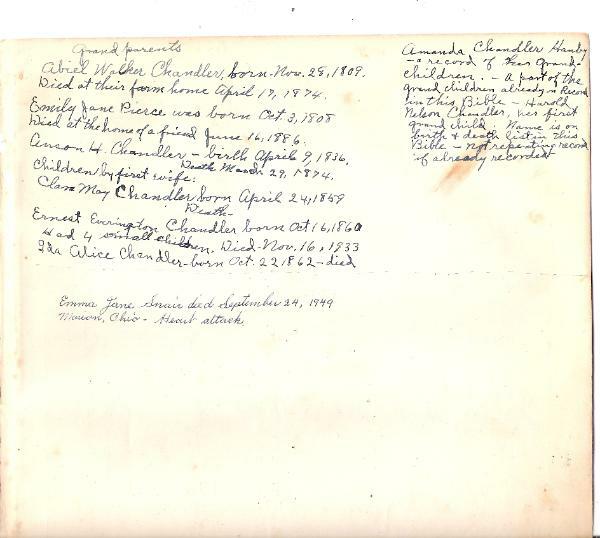 R. P.
Valerius Reginald chandler and Estella M. Ferguson were married Mch. 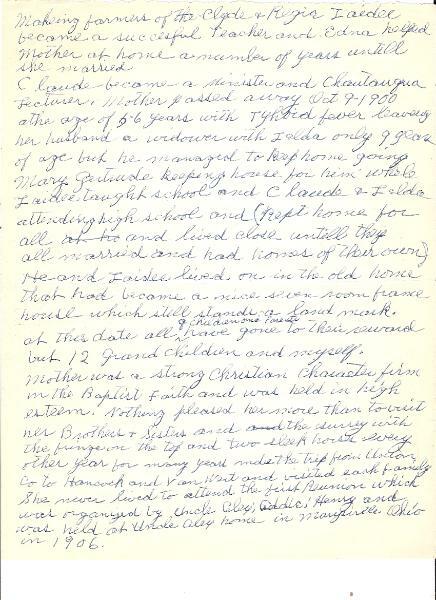 30, 1897 by Rev E.
Anna Mae Spano and Ross D. Shoup were united in marriage September 19th 1943 at St.
Paul's Lutheran Church Marion, Ohio by Rev. 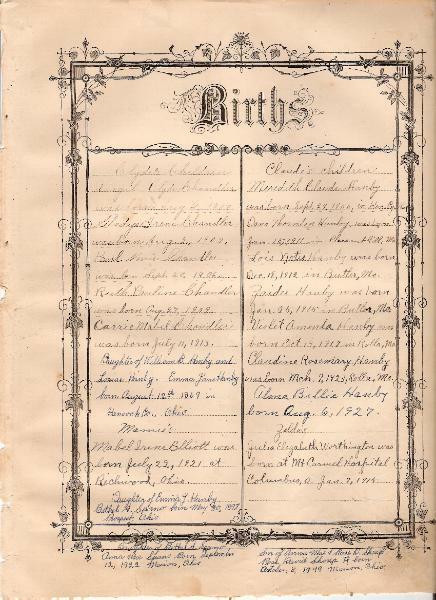 Mumford, Bucyrus, O.
Claude S. Hanby and Nannie A. Newlove were married Dec. 23, 1902, by Rev. Mart. 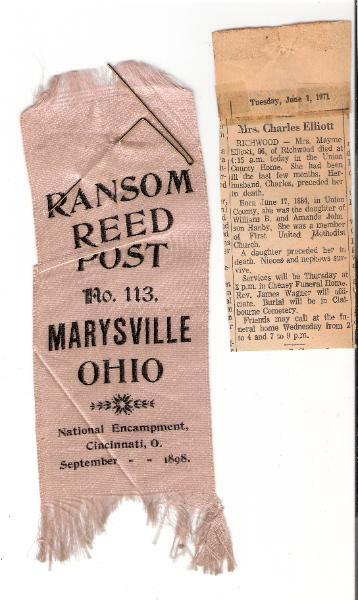 Mary Gertrude Hanby and Charles F. Elliott were married June 17, 1913 by Rev. N. J.
Harrold Nelson chandler was born Jan. 14, 1898. Clara Hazel Chandler was born Mch. 14, 1899. Amanda Ruth Chandler was born May 5, 1900. Esther Rosetta Chandler was born Sept. 28, 1911. Virgil Clyde Chandler was born Aug. 4, 1900. Gladys Irene Chandler was born Aug. 2, 1902. Paul Norris Chandler was born Sept 20, 1906. Ruth Pauline Chandler was born Aug. 27, 1909. Carrie Mabel Chandler was born July 11, 1913. Daughter of William B. Hanly and Louise Hanby. Mabel Irene Elliott was born July 22, 1921 at Richwood, Ohio. Daughter of Emma J. Hanby. Lois Notie Hanby was born Dec. 18, 1912 in Butler, Mo. Zaidee Hanby was born Jan. 25, 1915 in butler, Mo. Violet Amanda Hanby was born Oct. 13, 1917 in rolla, Mo. Claudine Rosemary Hanby was born Mch. 9, 1923, Rolla, Mo. Alma Billie Hanby born Aug. 6, 1927. Julia Elizabeth Worthington was born at Mt Carmel Hospital Columbus, O. Jan.
Ross David Shoup #born October 8, 1949 Marion, Ohio. Amanda Hanly died Oct. 9, 1900; Typhoid fever. Wm. B. Hanby died Jan 17, 1927. Edna G. (Chandler) Smith died Jan. 9, 1939, at her home, Richwood. Bertha (Norris) Chandler died May 12, 1938. Corn Plant Richwood O. - Blood clot in heart. Estella (Ferguson) Chandler died Sept. 27, 1944 at Reading, Mich.
Claude S. Hanby died from a heart attack Oct 17, 1944 at Little Rock, Ark. Harold Nelson Chandler died of Cholera infantum Sept. 24, 1898. 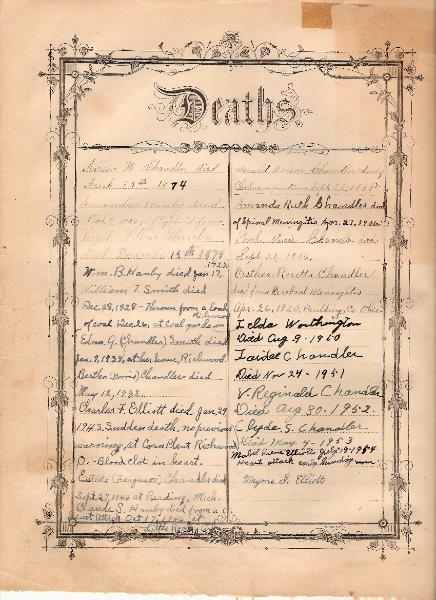 Amanda Ruth chandler died of Spinal Meningitis Apr. 27. 1906. Paul Norris Chandler died Sept. 21, 1920, Paulding Co. Ohio. V. Reginald Chandler Died Aug 30. 1952. 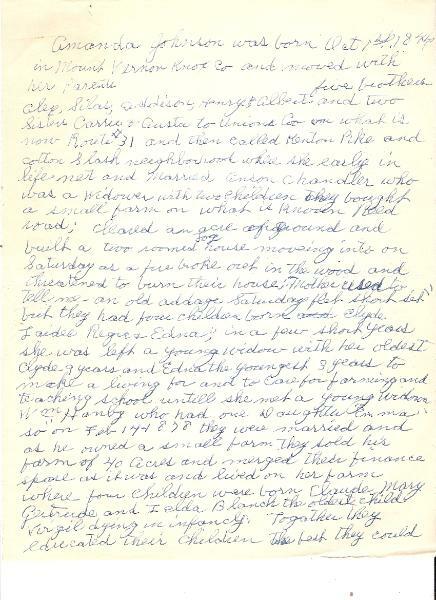 Mabel Irene Elliott July 18-1954 Heart attack early Sunday Morn. Abiel Walker chandler, born Nov. 28, 1809. 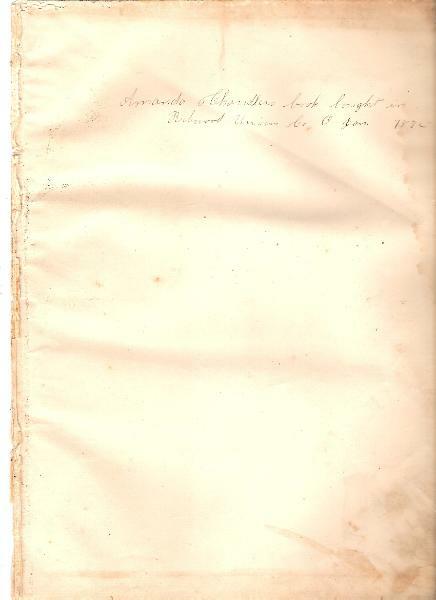 Died at the home of a friend June 16, 1886. Anson H. Chandler - birth April 9, 1836. Claude, Mary, Gertrude and Zelda Blanch the oldest child Vergil dying in infancy. 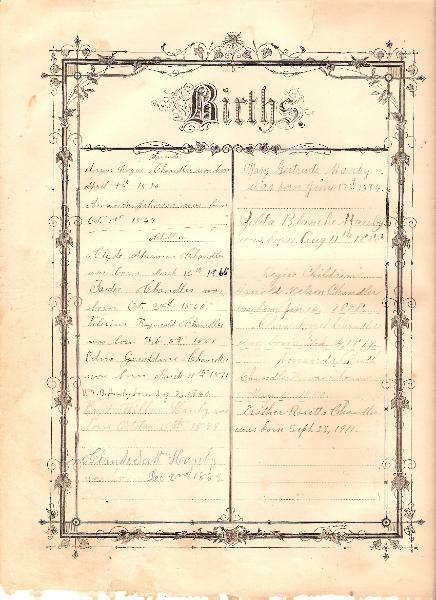 Alex; Addie; Henry and was held at Uncle Alex home in Marysville Ohio in 1906.
her in death.Born June 17, 1884, in Union County, she was the daughter of William B.